(Bloomberg) — Don’t write off gold in the battle of the havens. Bullion has lost out in a paradigm shift where the metal’s no longer viewed as the traditional refuge when investors are in a risk-off mood, but that won’t last, according to Rick Rule, chief executive officer of Sprott U.S. Holdings Inc.
Investors are favoring U.S. Treasuries, and that’s seen the dollar get stronger, Rule said in an interview from Vancouver Wednesday. But the greenback’s strength is relative, not absolute, and the overwhelming faith that the global saver has placed in the U.S. currency is “probably partly misplaced,” he said. “It used to be that investors looked much more broadly at a basket of currencies when valuing gold,” said Rule, 65, who’s been involved in the market for four decades. “It seems now that the dollar really has obtained hegemony, and the consequence of that is that the fight really does seem to be between the dollar and gold, and gold seems to be losing. I don’t think that that continues, but I can’t tell you when that changes.” "The fight really does seem to be between the dollar and gold, and gold seems to be losing." 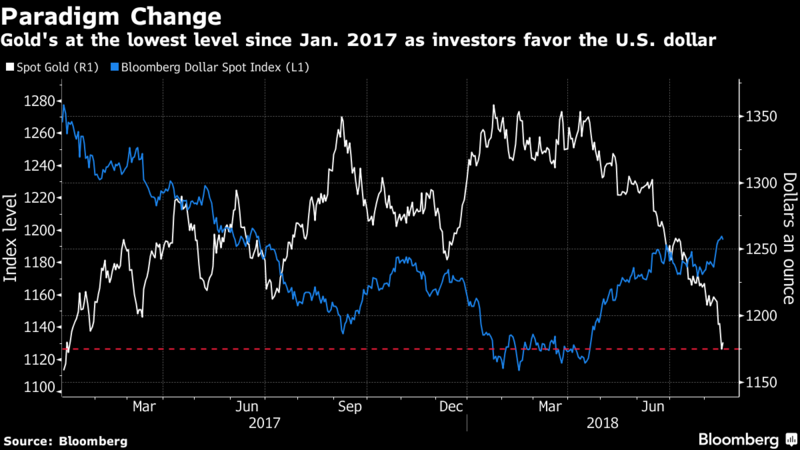 Bullion has slumped to the lowest since January 2017 and is set for a fifth month of losses as investors flee to the dollar amid trade tensions, emerging market turmoil and a Turkish financial crisis. A hawkish Federal Reserve and buoyant U.S. equities have also boosted the greenback, now near a 14-month high. The precious metal may regain its appeal once investors start to look beyond the relative strength of the U.S. economy to other countries and focus more on the standalone strength of the U.S. and whether they want to be a creditor to an economy with a balance sheet “that’s as out of whack as the U.S.,” Rule said. U.S. government debt has more than tripled since 2007, while tax cuts and new federal spending have fueled a budget deficit that the Congressional Budget Office predicts will reach $1 trillion in 2020. With the Federal Reserve winding down debt holdings, U.S. note and bond sales haven risen to levels last seen in the aftermath of the recession that ended in 2009. Rule holds physical gold in his personal portfolio as a form of insurance. He still sees gold reaching $1,400 an ounce, a level he forecast earlier this year, but refrained from giving a time frame. Spot gold rose 0.4 percent to $1,178.30 on Friday. Sprott U.S. Holdings is a subsidiary of Toronto-based Sprott Inc., a precious-metals focused money manager with assets of about C$11 billion ($8.4 billion) as of June 30.